Last week on Bill Don’t Lie, Tom Haberstroh and Bill Simmons spoke about the rapid increase of 3-point shooting in the NBA. These days, it’s a common conversation topic around the league, and it should be: The rise of the 3 is the most tangible element of NBA basketball’s rapid evolution. But to increase the number of 3s, you also have to take something away. Today, we also find ourselves in the midst of an unprecedented 2-point recession, and you can see its fingerprints on everything from where guys stand on the court to free-agency valuations to player development. 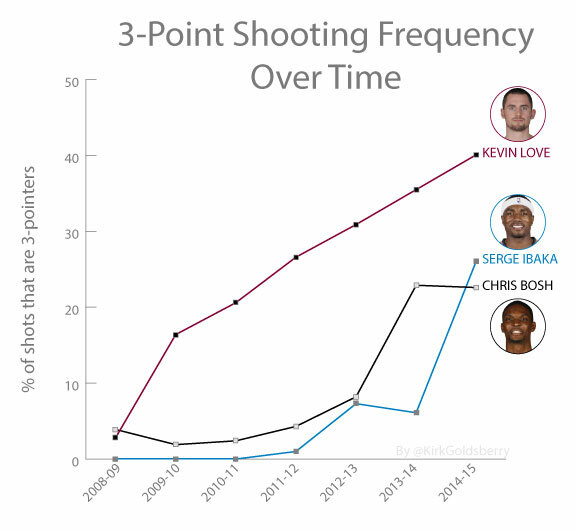 Perhaps no single player symbolizes the league’s new inside-out economy more than Kevin Love. Just a few years ago, we billed Love as the NBA’s next great Hall of Fame power forward. He was a top-10 player who could post up on the block, score in the paint, rebound like Charles Barkley, and fire outlet passes that would make Wes Unseld blush. Then a funny thing happened on the way to Springfield: Love’s game began to shift and instead of continuing to perfect the offensive tools of the conventional power forward, he transformed into arguably the most overqualified spot-up shooter in the league. Whether by design or accident, when the NBA Competition Committee implemented the 3-point line in the 1979-80 season, it began a process that eventually ushered us into a brave new hoops world where conventional power forwards are less useful than ever. As more teams take advantage of the 3-point line, a second low-post presence is now recognized as inefficient and anathema to spacing. And while there’s no shortage of think pieces on what is wrong with Kevin Love, it’s hard to find lamentations for how the league’s boundless appetite for 3s is forever cheapening traditional forms of basketball practice and luring more and more bigs away from the blocks. Despite recent comments suggesting a desire to do otherwise, Love has embraced the recent perimeter-oriented trends of basketball philosophy, but by doing so, he can’t function as the multi-purpose, ball-dominant, inside-out post presence he once looked well on his way to becoming. So maybe the current Love saga, in which he’s now a third wheel rather than a third star to LeBron James and Kyrie Irving, has just as much to do with a young power forward trying to keep pace with massive shifts in how the league approaches offense as it does with a guy trying to fit in in Cleveland. During his rookie season, Love rarely strayed beyond the arc, as only 3 percent of his shots came from out there — compared to 40 percent this season. Lest you think this is entirely symptomatic of his place in the Cleveland offense, last year as an alpha dog in Minnesota, Love took 36 percent of his shots from downtown. Like fellow 4s Serge Ibaka and Chris Bosh, he has greatly increased his 3-point diet since entering the league. The new “pace and space” era has produced some beautiful basketball, but those pleasing aesthetics come at a cost: The game’s most traditionally dominant players are being asked to kindly get out of the way and make room for the new breed of drive-and-kick attackers who now function as the engines of our contemporary scoring economies. There’s a battle outside [the arc] and it’s raging. 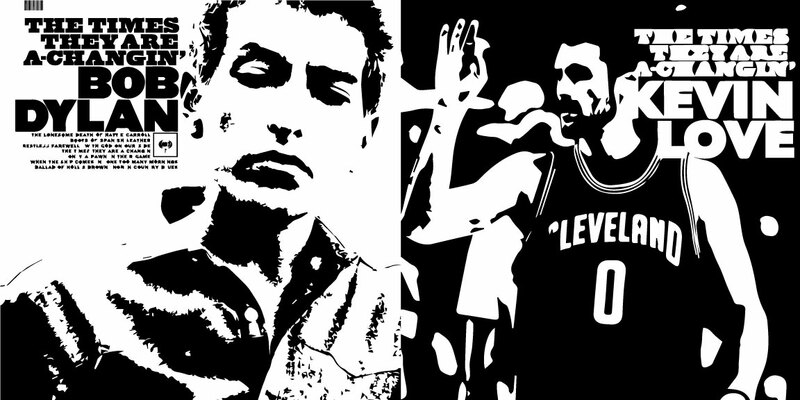 Just as circumstances in the 1960s demanded Bob Dylan to be more than just the next Woody Guthrie, the current NBA is asking Love and his cohort of young bigs to do things that Barkley and Malone didn’t do. In 2015, Love is the spokesman of the stretch-4 generation and he’s going electric out beyond the 3-point meridian. But while pace and space is unquestionably fun to watch, it’s time for the NBA Competition Committee to at least ask the question: How far do we let this go? Let’s consider Anthony Davis, who’s not only the best power forward on the planet but is poised to soon become the best player in the world. Davis can already seemingly do everything on a basketball court, but the scary part is that at 22 years old, his game is still developing. As I watched Davis play against the Rockets last week, my friend Mason Ginsberg, who writes about the Pelicans for True Hoop, suggested that Davis, a power forward with a strong jumper, would be shooting a lot more 3s next season. That’s when it occurred to me: I’ve had enough. I don’t want Anthony Davis shooting 3s. I don’t want him to mimic Kevin Love’s outward migrations. No, I want him showcasing his alien talents much closer to the basket. Hundreds of NBA players can be catch-and-shoot guys beyond the arc, but only one player in the league can do the things Davis does inside of it. When a phenom such as A.D. becomes incentivized to act more like Steve Novak than like Hakeem Olajuwon, something’s broken. Yet, given the current rule structure, that’s exactly what Davis should do. Imagine if NBA teams could decide whether or not to have the 3-point line in their home gym. The Grizzlies wouldn’t have it, and neither would the Pacers, while the Warriors, who play spectacular basketball, definitely would have it. But how would Golden State fare when it had to play at Memphis or Indiana, on a floor where a 24-foot shot is no longer magically worth 150 percent as much as a 21-foot shot? Golden State has built a near-perfect offensive machine for the 2014-15 season. They rank second in the league in offensive efficiency, thanks to the second-most 3-point production and league-leading 3-point shooting efficiency. However, this splendid machine commonly depends on guys like Harrison Barnes and Draymond Green playing the respective roles of power forward and center — not exactly the low-post pairings of Malone and Mark Eaton or Kevin McHale and Robert Parish. According to positional estimates on Basketball-Reference, Barnes logged just 13 percent of his minutes at power forward during his rookie season in 2012-13; this year, 87 percent of his minutes come as a 4. And yet, like Love, Barnes shoots a ton of 3s. Now, don’t get me wrong: The 3-point line has undoubtedly facilitated the rises of aesthetically grand performers like Stephen Curry, Damian Lillard, and Klay Thompson — all perimeter geniuses and among the most valuable assets in the league. But while the line has elevated the value of backcourt snipers, it’s slowly squeezed out a certain type of player who made his living close to the hoop with patience, power, and all kinds of tight-space footwork. Today’s power forwards have been forced to play the position in a way that only barely resembles their ancestors. In fact, as we’re seeing with Love, they’re playing in a way that barely resembles earlier incarnations of themselves.